A life well-lived is steeped in God and in awareness of surroundings and appreciation of the senses. Call it knowledge. Call it wisdom. Without such there are only positive and negative experiences in an existence void of true depth and purpose. We miss the meaning of life when we miss the crux. We can find that meaning in a section of the Bible that is known by many as a nice, quaint collection of wise sayings and maxims. Proverbs 1 is all about gaining wisdom, instruction, understanding, and insight. It’s about learning right, just, fair, and prudent behavior. This teaching is for all of us who need it: the young, the old, the wise, the discerning seeking lessons in truth. Put another way, the source of real knowledge is in the fear, respect, awe and trust in the Lord God. Those that reject God are depicted as those who despise wisdom and instruction. It’s a frank, non-apologetic statement about the fundamentals of life. It’s not easy to ignore such a call out. 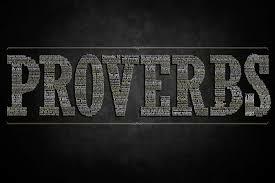 Proverbs was written predominantly by King Solomon, who ruled the nation of Israel in the years 970-931 BC. He was the second son of King David and his wife Bathsheba. What we mostly know about him is written in the Old Testament historical writings of 1 Kings and 2 Chronicles. In addition to the collection of Proverbs, he also wrote Ecclesiastes and Song of Solomon, both in the Biblical Scriptures. What’s interesting to consider in the Book of Proverbs, which boldly claims to be the source for gaining wisdom, instruction, and right behavior, is how Solomon acquired his knowledge and insight. Although young, Solomon literally became famous because of his wisdom. As it was God-given, it was noted by others throughout the land. The most well known incident was when two quarreling women came to him as judge with a baby whom both claimed as their own (1 Kings 3:16-28). Solomon easily resolved the dispute by commanding the child to be cut in half and shared between the two. One woman was prepared to accept the decision, the other begged the King to give the live baby to the other woman. Solomon then knew the second woman was the true mother. Given his knowledge source, are we really reading Proverbs with an eye toward truly God-inspired knowledge and wisdom? Proverbs 1:8-19 highlights that sons particularly are to heed the wise instructions of their parents. Stay clear of those that would draw you into dark and evil actions that would hurt others for self-gain and short-term benefit. The text notes that they will certainly be caught and suffer in for their foolishness. While not many of us truly travel with evil thugs, we should be evaluating the quality of those influencers around us. In the rest of Proverbs 1 (20-33), Wisdom now takes on a persona and calls out a strong rebuke. How long will fools and evil ones mock and continue in denying knowledge? Repent rather and Wisdom will be revealed and made known. You will get your just rewards as you disregard wise advice and refuse to listen. Disaster and calamity will strike and overtake you like a storm; distress and trouble will sweep over you like a whirlwind and overwhelm you. These people will call out but will be shunned and denied. Since they hated knowledge and did not fear God, they will be left to their own empty fruit, be destroyed and die. Only those who listen will live in safety, ease and without fear of harm. These are some very harsh words that speak to dire consequences for the foolish. Do you sometime dabble in foolishness? Yes, Proverbs 1 lays a strong foundation and case for knowledge and wisdom. Understanding that this does not come from one man’s personal notion or opinion, but rather from a Higher Source, we should be challenged to read it often, study it, and heed it. Are you truly knowledgeable and wise?